Deidre O'Brien, Apple's vice president of people, speaks at a news conference Thursday announcing Apple's plans to build a $1 billion campus in North Austin. Tech giant Apple announced today it plans to invest $1 billion in a new Austin campus. The 133-acre campus off Parmer Lane is about a mile away from Apple's existing campus and would accommodate 5,000 new employees. The new facility is slated to open in 30 to 36 months. At a press conference this morning, Kristina Raspe, vice president of global real estate and facilities at Apple, said the facility would include 50 acres of preserved open space. 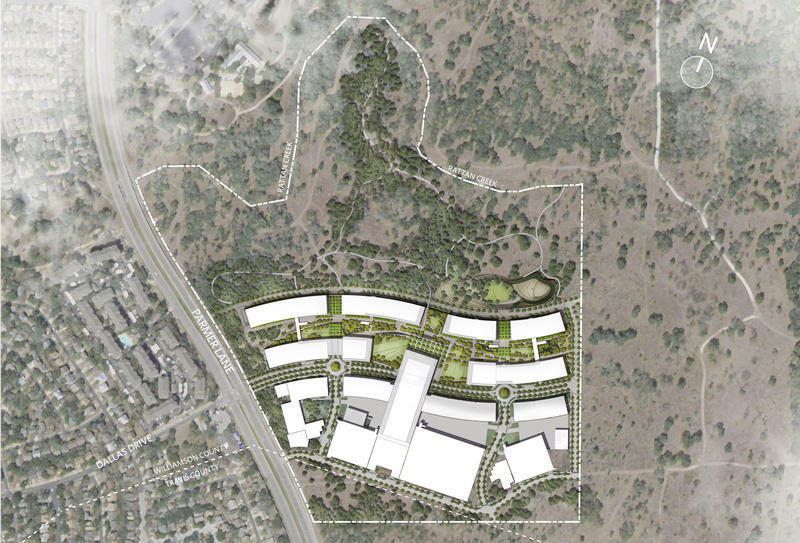 The proposed site for the new campus in Austin. "And, like all of our Apple facilities worldwide," she said, "it will be powered by 100 percent renewable energy." She said site preparation would begin next year. Texas Gov. 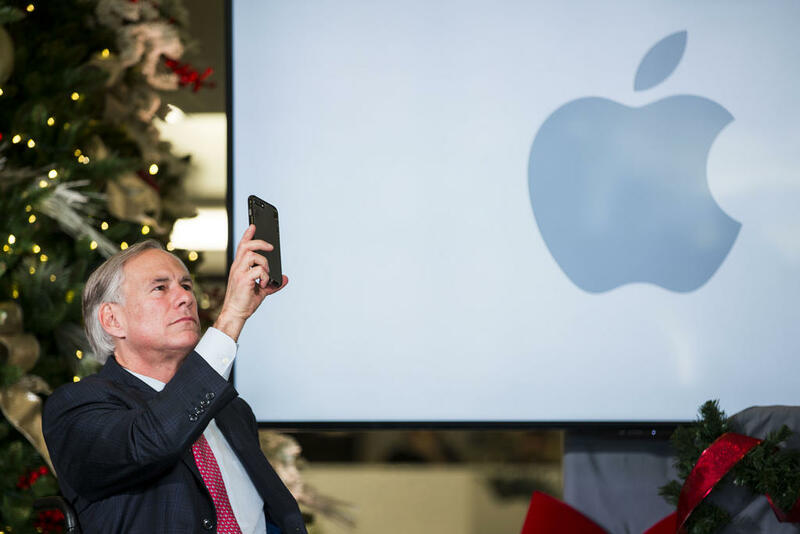 Greg Abbott participates in the news conference announcing Apple's expansion in Austin. 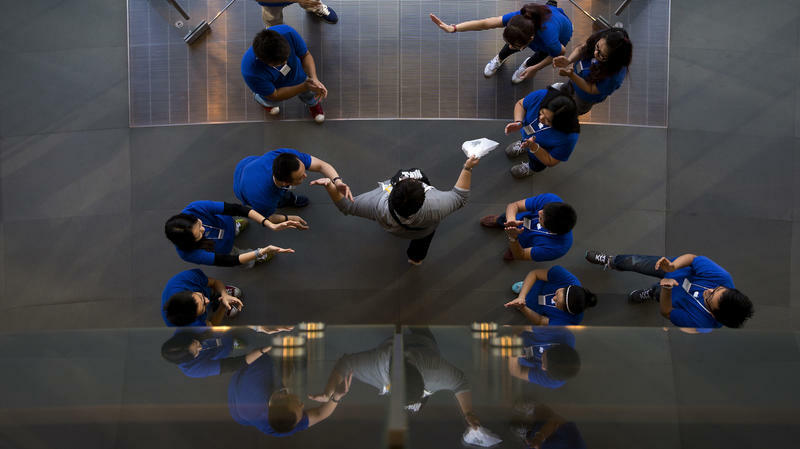 Apple already has 6,200 employees in Austin and says its new campus could allow it to boost its Austin workforce to as many as 15,000 employees, which would make it the largest private employer in Austin. “Mrs. Claus told me that this holiday season I would find a gift or two from Apple under my tree,” Mayor Steve Adler joked at the event. He told KUT he’s happy Apple is investing even more in the city. Outgoing Texas House Speaker Joe Straus thanked the tech giant for making "another major investment in Texas" this morning. "This shows that a business-friendly state not only offers low taxes and competitive incentives, but is also welcoming to all workers," Straus said. "We need to maintain this inclusive, comprehensive approach to economic development." Apple says the 5,000 jobs it plans to bring to Austin will be in its engineering, R&D, finance, sales and customer support departments. The company also announced plans today to build new sites in Seattle, San Diego and Culver City and expand its facilities in New York, Pittsburgh and Colorado. “Apple is proud to bring new investment, jobs and opportunity to cities across the United States and to significantly deepen our quarter-century partnership with the city and people of Austin,” Tim Cook, Apple’s CEO, said in a statement this morning. Apple made a deal with Austin in 2012 that gave the Cupertino-based company $8.6 million in city incentives over a 10-year period to set up shop at its current campus. The state also kicked in $21 million in incentives. The state could give Apple as much as $25 million from the governor's Texas Enterprise Fund, and the tech giant could get money from Williamson County as well, according to Austin City Council Member Jimmy Flannigan. Flannigan, whose district houses the site for the new campus, told KUT the city won't offer money for the development.